Governments' SECRET WAR Against Cash Exposed! If Americans wish to withdraw cash, why would the banks not just let them take their dollars and go? Because doing so might unravel today’s economic grand illusion and bring the whole system down, according to THE SECRET WAR, a White Paper by Craig R. Smith and Lowell Ponte. * Under threat of regulatory punishment, banks must now spy on you for the government. * Our government has made it risky to carry cash due to tougher asset forfeiture laws. * In a cashless future it will become much easier for the government to rob you. 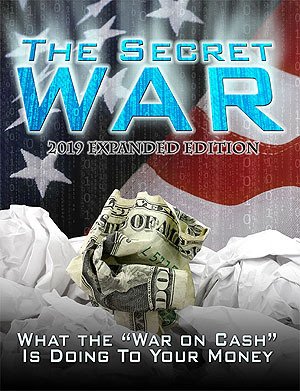 Get a FREE copy of THE SECRET WAR today by calling 800-289-2646 or register here.